Two weeks ahead of anticipated nationwide protests against the president, Egypt's Mohamed Morsi has issued a decree announcing a regional governors reshuffle. 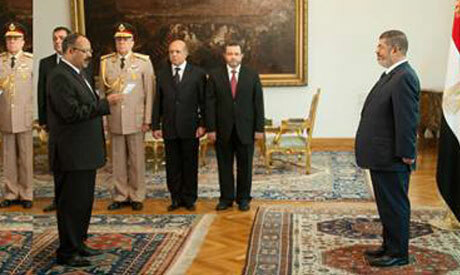 The newly-appointed governors were sworn in on Monday at the presidential palace in Cairo. Seven of the new governor appointees are members of the Muslim Brotherhood, while six others hail from a military or police background. The final three appointees do not appear to be politically affiliated. The most controversial appointment is the new Governor of Luxor, Adel Asaad El-Khayat, a 52-year-old engineer and founding member of Al-Gamaa Al-Islamiya in Upper Egypt’s Sohag. Khayat’s appointment stirred controversy due to the Islamist group’s role in the murder of at least 58 tourists and 4 Egyptians in the infamous Luxor massacre in 1997. The incident was followed by years of crippled tourism and a crackdown on the formerly militant group. El-Khayat was also detained without charge for a year following the assassination of late president Anwar El-Sadat by members of Al-Gamaa Al-Islamyia in 1981. President Morsi, who hails from the Muslim Brotherhood, is often accused by the opposition of favoring his "people" in government appointments. Following the recent reshuffle – in which seven members of the Islamist group were appointed to governorships – 11 out of 27 governorates are now under Brotherhood control. Governor of Beni Suef: Adel Abdel-Moneim Hassan, a leading member of the Muslim Brotherhood’s Freedom and Justice Party and its supreme body. The 63-year-old Islamist is also Dean of the Faculty of Science at Beni Sueif University. Governor of Daqahliya: Sobhi Atteya Younis, a 52-year-old member of the Muslim Brotherhood and the group's spokesman in the Nile Delta Governorate. Younis is a founding member of the Freedom and Justice Party and has been a professor of Archeology and History at Mansoura University since 2009. Governor of Menoufiya: Ahmed Shaarawi Mohamed, a leading Muslim Brotherhood member and head of the group's Sisterhood division. Abou El-Ezz is also a founder of the Brotherhood’s television channel, Masr 25. Governor of Gharbiya: Ahmed El-Beili, a Muslim Brotherhood member who took part in the drafting Egypt’s post-revolution constitution. El-Beili, who graduated with a bachelor's degree in pharmacy from Alexandria University in 1978, is also the tax committee chairman of the General Union of Pharmacists. Governor of Beheira: Osama Ibrahim Suleiman, secretary general of the Freedom and Justice Party in El-Beheira since its founding in 2011. Suleiman is both an engineer and a businessman. Governor of Fayoum: Gaber Abdel-Salam Ibrahim, leading member of the Freedom and Justice Party. Born in 1958, Ibrahim is the trustees chairman of the Namaa Foundation for Research and Development in Fayoum. Governor of Red Sea: Tarek Mahdi, a 63-year-old major general and former member of the Supreme Council of Armed Forces (SCAF). Mahdi headed the Radio and Television Union from February 2011 until August 2011, when he was appointed governor of Al-Wadi Al-Gadid by the then-ruling SCAF. Governor of Marsa Matrouh: Badr Tantawi El-Ghandour, a major general who served as director of cyber warfare. Governor of Port Said: Sameh Ahmed Qandil, a military general. Governor of Aswan: Ismail Hassan Attiyet-Allah, a military general and former director of the Faculty of Air Defense. Governor of Damietta: Tarek Fatah-Allah Khidr, a police general and member of liberal Ghad Al-Thawra party. Governor of Alexandria: Maher Babers, governor of Beni Suef since last September. Babers is the judge who headed the fact-finding commission investigating violence that took place on 8 and 9 April 2011 in Tahrir Square. He also took part in the investigations of the 'Battle of the Camel' incident. Governor of Ismailia: Hassan El-Hawi, an electrical engineer who is on the board of directors for the Canal Company For Electricity Distribution. Governor of Qena: Salah Abdel-Meguid, a 52-year-old expert on environmental affairs. He is also a consultant to the German Friedrich-Ebert Foundation which promotes political awareness in the governorates. The last gubernatorial reshuffle – which included ten governorates – occurred last September.